SAN ANTONIO, Tex. (WPVI) -- Philadelphia is quickly going from the city of underdogs to the City of Champions. 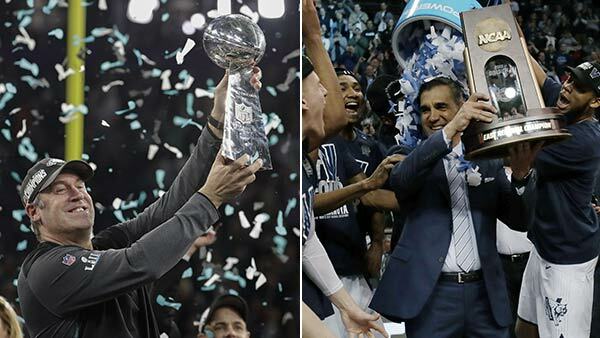 From one championship team to another, Philadelphia Eagles players are congratulating the Villanova Wildcats on their big win, just a few months removed from the Birds' Super Bowl victory. Hear it from Jim: Villanova are national champions. Jim Gardner and Jamie Apody report during Action News at 11 p.m. on April 3, 2018. The Philadelphia Eagles posted images of players giving the Villanova 'V' sign. "V for victory. Congrats to the National Champions, @NovaMBB!" #LetsMarchNova" the team tweeted. Kicker Jake Elliott tweeted, "City of Champions #PhillyPhilly"
Offensive tackle Lane Johnson tweeted, "Another [trophy] for Philly! #NationalChampionship" with a GIF of DJ Khaled's 'Another one' quote. Running back Kenjon Barner tweeted, "Major S/O to Villanova!! Philly stand UP!! 1st the SuperBowl now NCAA champions is say it's a great start to the year for sports in Philly!!!" Wide receiver Nelson Agholor tweeted, "Philly!!!!!!!!" Cornerback Sidney Jones tweeted, "Congrats @NovaMBB." The voice of the Eagles, commentator Merrill Reese, said, "Jim Nantz said what we were all thinking....Philadelphia has become "a city of champions". I think we can safely say that this Villanova team is the greatest college basketball team in our area's history. They absolutely ran away with this tournament!!!" Jim Nantz said what we were all thinking....Philadelphia has become “a city of champions”. I think we can safely say that this Villanova team is the greatest college basketball team in our area’s history. They absolutely ran away with this tournament!!! Tight end Zach Ertz tweeted "Divincenzo... LETS GOOOO!!!" Donte DiVincenzo had 31 points for the Wildcats, the most scored against the Michigan Wolverines this season. Defensive end Chris Long also wanted to show his support for DiVincenzo, even if he spelled the Villanova star's name wrong. "I know I spelled it wrong, whatever," he commented. Who is Villanova breakout star Donte DiVincenzo?